1. What’s your elevator pitch for Children of the Silent Majority? How would you describe the book in two or three sentences? While the 1968 generation first threatened the conservative realignment that Republican leaders envisioned, it eventually offered a vital asset in the increasingly image conscious political environment. 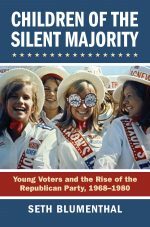 More lasting, Nixon’s youth effort fortified the GOP with a cadre of new voters and party leaders after the voting age fell to eighteen. 2. Children of the Silent Majority started as your dissertation. How long did you spend working on the book? My first research trip was to the Nixon Library in 2009, and so it began. 3. What led you to research the Republican efforts to recruit young voters? Watching an obscure guerilla television documentary called Four More Years about the Republican National Convention in 1972, I noticed how the Young Voters for the President popped up everywhere and I wondered who they were, and what they were thinking. It took me some time, but I found out. 4. What was the most challenging aspect of researching and writing the book? 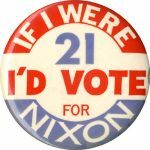 There isn’t really anything else about Nixon’s Young Voters for the President, so that was exciting but also daunting as the historiography was non-existent. In addition, as I interviewed YVPers I had to resist the nostalgic interpretations of the GOP’s youth effort. Many of the people I talked to referred glowingly to this experience, but of course, not everybody thought so highly of Nixon and his campaign. 5. 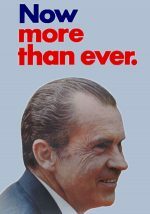 Your book goes into great detail how, at the height of the 60’s ‘flower-power’ movement, President Nixon and the Republican Party was able to build its majority. Can you draw any parallels between 1968 and 2018? Are Republicans using the same tactics to win young voters? In some ways, I think the message is that the GOP has largely forgotten young voters’ role in their rise to power. President Trump has been very bad for the Republican brand with youth. Though, I think one thing that is consistent is that College Republicans are still more organized than their Democratic counterparts. I spend quite a bit of time in the book explaining the training program developed by the CR and the Young Voters for the President, and that professional structure and relationship with the senior party officials still provides leadership schools to recruit and cultivate future Republicans. 6. Have you noticed any efforts by either party in the current election that remind you of the Republican playbook used from 1968-1980? Obviously Obama comes to mind. But interestingly, I have come to appreciate the irony that Obama succeeded in rallying the youth coalition that McGovern sought to build by using the organizational techniques and structure from Nixon’s campaign. 7. As Republican attempt to maintain and build their current majority, have any party leaders (the actual children of the silent majority) made any comments about how they were won over by the party? Karl Rove comes to mind as he talks quite a bit about his youth activism and the lessons he learned about campaigning in the early 1970s as he too played a central role in the Nixon youth campaign in 1972. Paul Manafort was a Young Republican leader who played a prominent role in Ford’s youth vote effort. If you look at prominent College Republican and Young Republican alumni it’s a who’s who in GOP politics, but in most cases they were political animals before they joined these groups so it’s more about training and organizing youth than winning them over. I interviewed over 15 former YVP members, many went on to very successful careers as political consultants, campaign managers and politicians. Some grew up in Democratic families in the urban, ethnic enclaves or from the South and saw the GOP as an alternative to one party rule. Well, sadly, Hunter S. Thompson. He wrote the most about Nixon’s young voters, and despised them, I think because he appreciated their significance in countering the (and his) liberal dream for youth politics in 1972 and the future. We could sure use him these days. But as for actual living human beings, Senator Bill Brock who is now 87. He is a fascinating political figure in the GOP’s history, a star in the book, and he deserves his own biography.